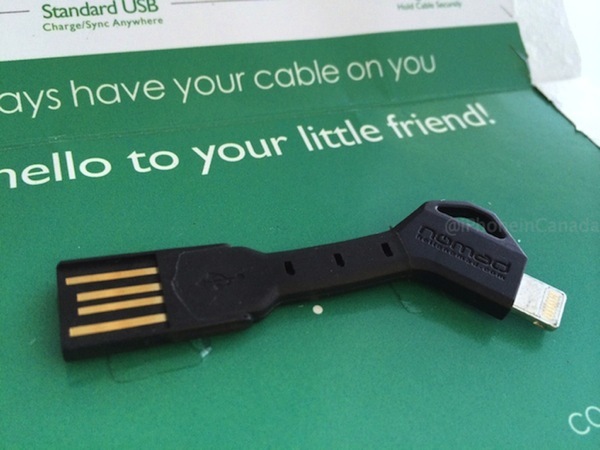 Last November we reviewed NOMAD’s ChargeCard for the iPhone 5/5S, a flat Lightning USB cable that fits in your wallet. 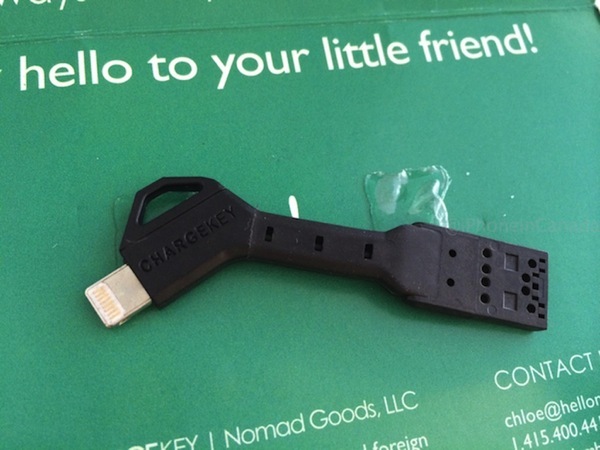 The company recently sent us their latest ChargeKey, a compact Lightning USB cable (it charges and syncs) for your keychain to test out and after using it for a few weeks, we’re impressed. We never leave the house without our keys, wallet and iPhone. The ChargeCard, despite its usefulness never made it into our wallets. It’s thin, but still too ‘thick’ for our liking. This is where the ChargeKey excels. It is literally the size of a key and fits onto your keychain which guarantees you’ll always have a Lightning cable with you—plus it’s incredibly light. 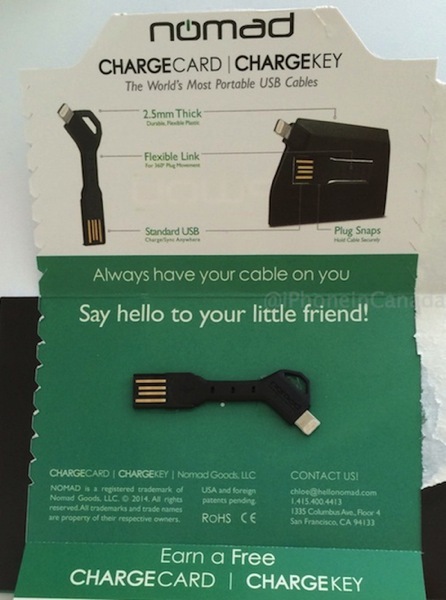 The ChargeKey comes in simple packaging but is extremely well built. It’s flexible and the plastic is very strong and sturdy. The best part is the hole to attach to your keyring is thin enough to make removing it very easy. The cable is strong enough to hang, flex and bend. During a recent Super Bowl party our iPhone 5s was running low on battery (of course). Luckily, with the ChargeKey I was able to charge my iPhone by plugging it into the USB port on a friend’s TV—hanging—without any problems (just don’t try it with an iPad!). Despite not being certified as MFi, we had no warnings or issues with the cable while charging. As for some downsides to the ChargeKey, time will tell to see how well the rubber holds up to continuous flexing. Also, being so small when it’s not on your keychain it can be easy to lose. It’s not MFi certified so its future could change should Apple change things up for third party cables. The ChargeKey is moderately priced at $25, which is a few dollars more than what you’d pay for a Lightning USB cable from Apple, but more expensive than other third party options. The website offers a $2 off coupon if you perform social network ‘action’ (i.e. ‘Liking’ them on Facebook, etc). Shipping is free if you order two or more and right now there is a backlog on orders still. For new ChargeKey owners, the package details three easy ways how you can earn a bonus ChargeKey for free (we aren’t at liberty to reveal it) by spreading the word. At the end of the day, the ChargeKey has become one of our favourite iPhone accessories to date. Knowing that you have a Lightning cable with you at all times is a powerful (and satisfying) thing especially when your iPhone battery is running low. Highly recommended. 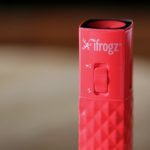 Click here to learn more about NOMAD ChargeKey. Wait. We’re not done. 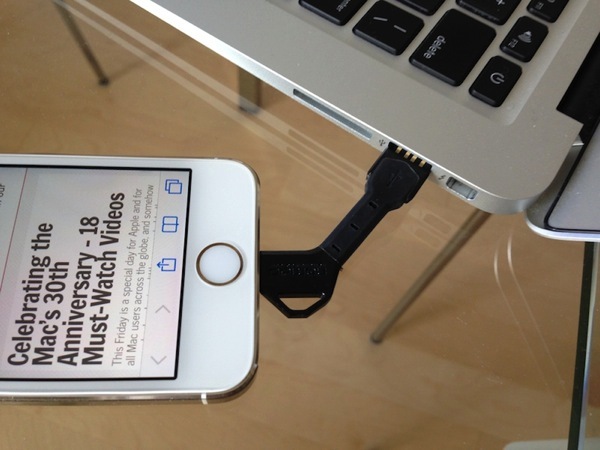 NOMAD has graciously donated one ChargeKey for iPhoneinCanada.ca readers! This contest will be easy. All you have to do is leave a comment below explaining why you want one. Contest ends in exactly one week on Feb. 19 at 3PM PST. Good luck! Update: Congrats to Rainer Stevens for winning our contest and everybody for entering. We’ll have another great contest coming up soon! We’ll be in touch!